Michelle has performed professionally at hundreds of weddings since the age of 12. It all started with her mother - a violinist - forming a family trio to give her daughters performance and ensemble opportunities. With 14 years of wedding experience Michelle has a wealth of knowledge and insight to help you plan the music for your wedding. She is happy to assist with repertoire choice and programming to suit your special day. 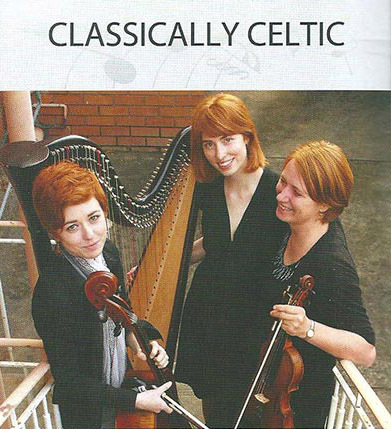 Besides solo harp, Michelle still performs with her family trio Classically Celtic: a versatile harp , violin & cello trio, that is also available for hire as a violin and harp duo. Michelle's repertoire list is below - feel free to choose specific pieces from here for the Processional, Signing and Recessional. If you're not sure, contact Michelle as she is happy to make further suggestions and assist you in choosing music that reflects your taste. Michelle is often asked to stay for the hour after the ceremony to provide background music as the guests have drinks/canapés. This is for 2 consecutive hours and works when the pre-dinner drinks are straight after the ceremony in the same location. Package #3 - It's up to you! Basically it's all up to you - it's your special day remember! The ideas above are just suggestions to help you visualise how harp music can feature at your wedding. The timings and ensembles (solo, duet & trio) can all be customised to suit your wedding. Just contact Michelle with what you have in mind.